And the introduction of online bill payments for taxes and sewer bills, electronic billing for sewer, and other e-services that make it easier to do business with Town Hall. And that’s just a brief snapshot of our accomplishments in this last year. I look forward to continuing our momentum in 2015, with plans for a redesigned website and a new GIS mapping system, and a number of projects aimed at enhancing local parks, recreational facilities and other infrastructure. As always, I welcome your feedback on our programs and services. 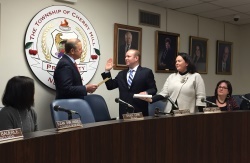 You can reach my office at (856) 488-7878, or e-mail me directly at MayorCahn@chtownship.com. Have a wonderful New Year! 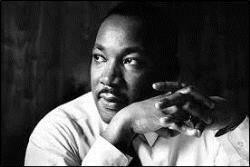 As we approach Martin Luther King Day on Jan. 19, the Township and Cherry Hill Public Schools are partnering to collect supplies for five local organizations in need: the American Red Cross (items for the troops); Mothers Matter; the Cherry Hill Food Pantry; Camden County Animal Shelter and the Cherry Hill Public library. For a full list of requested items and more information, here. Collection boxes will be located through Jan. 16 at the Township Municipal Building, 820 Mercer St.; the Cherry Hill Public Library, 1100 Kings Highway N.; Cherry Hill High School West, 2101 Chapel Ave. (Jan. 12-16 only); and at Clara Barton Elementary School (Jan. 12 to 16 only). On Martin Luther King Day itself, volunteers can also assist with assorted trail-maintenance activities with the Cherry Hill Environmental Board, starting at 9 a.m. at Croft Farm (100 Borton's Mill Road). Thank you in advance for your support of these projects, and our efforts to promote Dr. King's message and legacy of service and selflessness. For more information, call the Department of Recreation at (856) 488-7868, or e-mail recreation@chtownship.com. 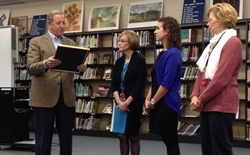 This week, I joined Superintendent of Schools Dr. Maureen Reusche, Board of Education member Kathy Judge and Beck Middle School Principal Dr. Dennis Perry to honor an outstanding Cherry Hill Educator, Beck math teacher Janet McGrath. Mrs. McGrath was award a 2014 Presidential Award for Excellence in Math and Science Teaching, the highest honor bestowed by the United States government specifically for K-12 math and science teachers. Established by Congress in 1983, the program recognizes just a few dozen educators nationwide every year. Mrs. McGrath arrived at Beck in January 2011, and in just that short amount of time, has established herself as one of our community's brightest educators. All of Cherry Hill's Public Schools -- and our educators -- are a constant source of pride for our community, and I'm always proud to acknowledge achievements such as this. Please join me in thanking Mrs. McGrath for her work at Beck, and in wishing her all the best as she continues her career. As you clean up from your family's holiday festivities, remember that a number of items can be recycled either curbside in your big blue can, or by dropping them off at the Department of Public Works at 1 Perina Blvd. 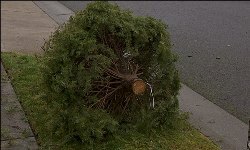 Christmas trees can be recycled curbside as part of your weekly yard-waste pickup, or taken to two designated locations for Christmas tree recycling through Friday, Jan. 16, at the Department of Public Works (1 Perina Blvd.) or in the rear of Town Hall (820 Mercer St.). Click here for more information. Remember: trees wrapped in plastic bags will not be collected. Old electronics and broken/unused Christmas lights are considered e-waste, and can't be recycled at the curb or in your blue can. However, they can be dropped off, 24/7, at the e-waste shed in the Public Works yard. Cardboard, wrapping paper and cards can be recycled in your big blue recycling can on your regular trash day. Cardboard must be broken down and placed in your can. Excess cardboard can be dropped off in two designated dumpsters to the rear of the Public Works yard. These are just a few of the common holiday items that can be recycled in Cherry Hill. For more information, visit the Public Works page on the Township website, or call DPW directly at (856) 424-4422. 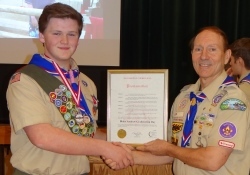 Last weekend, the Township honored Blake Grabenstein, a young member of Boy Scout Troop 52 in Cherry Hill, as he earned the prestigious rank of Eagle Scout. For his Eagle Scout project, Blake installed informational kiosks and dog-waste dispensers along the Old Orchard and Downs Farm Trails. Attaining the rank of Eagle Scout is not an easy task, and it's something just a select few scouts accomplish every year. In Cherry Hill, we have witnessed Eagle Scout ceremonies for dozens of remarkable young men in recent years, and we are proud to recognize their achievement. In the last year, the Environmental Board has overseen four completed Eagle Scout projects, and to date, coordinated a total of 20 Eagle Scout projects that have benefitted open space in Cherry Hill. Please join me in congratulating Blake on achieving his Eagle Scout rank, and in wishing him all the best in the future. The Winter/Spring 2015 edition of the Community Magazine has arrived in homes, and registration is now open for winter programs and classes offered through the Township Recreation Department. A full list of programs can be found in the magazine, along with the latest Township news, information and photos. View the complete catalog and register for classes by clicking here. For more information, call (856) 488-7868, or email Recreation@chtownship.com. and LibreOffice Calc, which are both free programs. In Part I of this 4 part course learn how to organize and store data, such as telephone numbers, addresses, and credit card information, how to use the built-in spreadsheet help information and how to use spreadsheets in the work place. PREREQUISITES: Basic Mouse and Keyboard Skills, some PC experience, or equivalent experience. Click here to reserve a spot now! Enjoy this program designed just for 2 year olds! Develop language and pre-literacy skills with short stories, songs, rhymes, movement and a simple craft. Please note: Participating siblings are welcome but must be registered. Click here to register today! Barbara Berman, certified professional organizer and owner of BB's Clutter Solutions, will teach the basics of organization and provide attendees with a 4-step organizing process to transform their space. This session will provide simple how-to's you can put into practical use right away. The event is free and open to the public. Click here to register now! Do you like reading comics and graphic novels? Do you want to try drawing your own? Join other kids each month to discuss a different series and draw your own comics. We'll provide the supplies, you provide the creativity. Click here to register now! Improve literacy skills and encourage school-readiness with this story time for children ages 3-6 featuring stories, songs, finger plays and a craft. Limited spaces are available, click here to reserve a spot today! Get inspired through creative story starters and writing games, plus, meet other teens who love to write! Click here to register now! Pinterest is a digital corkboard where you can pin recipes, crafts, and more. Learn to join, pin and follow friends. Please, also bring an established email address, which will be needed to create a Pinterest account. PREREQUISITES: Basic Mouse and Keyboard Skills. Click here to register today! Want some hands-on time with our Maker Playground equipment like the MaKey MaKey, 3Doodler pen, button maker and more? If you need a break from gadgets, you can play some ping-pong or MarioKart. Come see what you can create at CHPL! Click here to reserve spot now! Hill-opoly” is now available for purchase at locations around Cherry Hill! 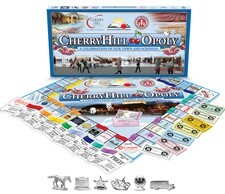 The game, which celebrates our local history and landmarks in the traditional Monopoly format, was created by the Cherry Hill Education Foundation in partnership with the Township, Cherry Hill Public Schools, and businesses throughout the community. You can pick up your copy today at Ponzio’s, Springdale Farm, the Garden State Discovery Museum, the Accessory Warehouse on Springdale Road, Cherry Hill Health and Racquet Club, the Bistro Restaurant and Toy Genius in Cherry Hill Mall, Bluedeer Yoga in the Tuscany Marketplace, and NuEar Hearing Center on Cooperlanding Road. Games are $40 each and proceeds benefit local schools. $25 of each game purchase is tax-deductible. Click here for more information, or to order. Environmental Center, 1301 Park Blvd. clubs and the food bank. • Learn how to start seeds for your garden. • Learn about the local community gardens. • Get up close and personal with worm composting and back yard chickens. • Master Gardeners on hand to answer all your "growing" questions. • For more information or to register, click here. Members of the community are invited to a special Visitors’ Sunday at the Unitarian Universalist Church (401 Kings Highway North), starting at 10:15 a.m. Sunday, Jan. 11. Guests will be warmly welcomed by friends and members. Learn more about Unitarian Universalism, the Uncommon Religion, and the many activities and resources the church offers. The community is accessible by wheelchair, and offers assisted-listening devices. For more information and directions, visit the Church website at www.UUCCH.org. As we approach Martin Luther King Day on Jan. 19, the Township and Cherry Hill Public Schools are partnering to collect supplies for five local organizations in need: the American Red Cross (items for the troops); Mothers Matter; the Cherry Hill Food Pantry; Camden County Animal Shelter and the Cherry Hill Public library. For a full list of requested items and more information, here [http://www.cherryhill-nj.com/DocumentCenter/View/2543] . Christmas trees can be recycled curbside as part of your weekly yard-waste pickup, or taken to two designated locations for Christmas tree recycling through Friday, Jan. 16, at the Department of Public Works (1 Perina Blvd.) or in the rear of Town Hall (820 Mercer St.). Click here for more information. [http://www.cherryhill-nj.com/CivicAlerts.aspx?AID=630] Remember: trees wrapped in plastic bags will not be collected. These are just a few of the common holiday items that can be recycled in Cherry Hill. 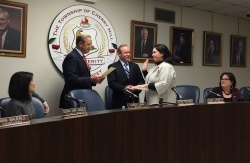 For more information, visit the Public Works page [http://www.cherryhill-nj.com/index.aspx?nid=179] on the Township website, or call DPW directly at (856) 424-4422.
news, information and photos. View the complete catalog and register for classes by clicking here [https://reconline.cherryhill-nj.com/] . For more information, call (856) 488-7868, or email Recreation@chtownship.com. and LibreOffice Calc, which are both free programs. In Part I of this 4 part course learn how to organize and store data, such as telephone numbers, addresses, and credit card information, how to use the built-in spreadsheet help information and how to use spreadsheets in the work place. PREREQUISITES: Basic Mouse and Keyboard Skills, some PC experience, or equivalent experience. Click here [http://host6.evanced.info/cherryhill/evanced/eventsignup.asp?ID=6153&rts=&disptype=&ret=eventcalendar.asp&pointer=&returnToSearch=νm=0&ad=&dt=mo&mo=1/1/2015&df=calendar&EventType=ALL&Lib=&AgeGroup=ALL&LangType=0&WindowMode=&noheader=&lad=&pub=1&nopub=&pa] to reserve a spot now! Enjoy this program designed just for 2 year olds! Develop language and pre-literacy skills with short stories, songs, rhymes, movement and a simple craft. Please note: Participating siblings are welcome but must be registered. Click here [http://host6.evanced.info/cherryhill/evanced/eventsignup.asp?ID=6130&rts=&disptype=&ret=eventcalendar.asp&pointer=&returnToSearch=νm=0&ad=&dt=mo&mo=1/1/2015&df=calendar&EventType=ALL&Lib=&AgeGroup=ALL&LangType=0&WindowMode=&noheader=&lad=&pub=1&nopub=&pa] to register today! Barbara Berman, certified professional organizer and owner of BB's Clutter Solutions, will teach the basics of organization and provide attendees with a 4-step organizing process to transform their space. This session will provide simple how-to's you can put into practical use right away. The event is free and open to the public. Click here [http://host6.evanced.info/cherryhill/evanced/eventsignup.asp?ID=6152&rts=&disptype=&ret=eventcalendar.asp&pointer=&returnToSearch=νm=0&ad=&dt=mo&mo=1/1/2015&df=calendar&EventType=ALL&Lib=&AgeGroup=ALL&LangType=0&WindowMode=&noheader=&lad=&pub=1&nopub=&pa] to register now! Do you like reading comics and graphic novels? Do you want to try drawing your own? Join other kids each month to discuss a different series and draw your own comics. We'll provide the supplies, you provide the creativity. Click here [http://host6.evanced.info/cherryhill/evanced/eventsignup.asp?ID=6163&rts=&disptype=&ret=eventcalendar.asp&pointer=&returnToSearch=νm=0&ad=&dt=mo&mo=1/1/2015&df=calendar&EventType=ALL&Lib=&AgeGroup=ALL&LangType=0&WindowMode=&noheader=&lad=&pub=1&nopub=&pa] to register now! Improve literacy skills and encourage school-readiness with this story time for children ages 3-6 featuring stories, songs, finger plays and a craft. Limited spaces are available, click here [http://host6.evanced.info/cherryhill/evanced/eventsignup.asp?ID=6136&rts=&disptype=&ret=eventcalendar.asp&pointer=&returnToSearch=νm=0&ad=&dt=mo&mo=1/1/2015&df=calendar&EventType=ALL&Lib=&AgeGroup=ALL&LangType=0&WindowMode=&noheader=&lad=&pub=1&nopub=&pa] to reserve a spot today! Get inspired through creative story starters and writing games, plus, meet other teens who love to write! Click here [http://host6.evanced.info/cherryhill/evanced/eventsignup.asp?ID=6146&rts=&disptype=&ret=eventcalendar.asp&pointer=&returnToSearch=νm=0&ad=&dt=mo&mo=1/1/2015&df=calendar&EventType=ALL&Lib=&AgeGroup=ALL&LangType=0&WindowMode=&noheader=&lad=&pub=1&nopub=&pa] to register now! Pinterest is a digital corkboard where you can pin recipes, crafts, and more. Learn to join, pin and follow friends. Please, also bring an established email address, which will be needed to create a Pinterest account. PREREQUISITES: Basic Mouse and Keyboard Skills. Click here [http://host6.evanced.info/cherryhill/evanced/eventsignup.asp?ID=6158&rts=&disptype=&ret=eventcalendar.asp&pointer=&returnToSearch=νm=0&ad=&dt=mo&mo=1/1/2015&df=calendar&EventType=ALL&Lib=&AgeGroup=ALL&LangType=0&WindowMode=&noheader=&lad=&pub=1&nopub=&pa] to register today! Want some hands-on time with our Maker Playground equipment like the MaKey MaKey, 3Doodler pen, button maker and more? If you need a break from gadgets, you can play some ping-pong or MarioKart. Come see what you can create at CHPL! Click here [http://host6.evanced.info/cherryhill/evanced/eventsignup.asp?ID=6209&rts=&disptype=&ret=eventcalendar.asp&pointer=&returnToSearch=νm=0&ad=&dt=mo&mo=1/1/2015&df=calendar&EventType=ALL&Lib=&AgeGroup=ALL&LangType=0&WindowMode=&noheader=&lad=&pub=1&nopub=&pa] to reserve spot now! nvironmental Center, 1301 Park Blvd. • For more information or to register, click here [http://events.r20.constantcontact.com/register/event?oeidk=a07ea3oza8y82b1ad68&llr=wjf7fucab] .